For the certified “pet people” out there (and you know who you are!) pets are part of the family. Pet lovers everywhere have come to expect all the fun “perks” that come with being human companions: lovely pet odors, errant bits of fur, the occasional accident, and the variety of presents they can track in, like dirt, leaves or (and this is for you cat lovers) the occasional dead lizard. But a pet-friendly home doesn’t mean you have to resign yourself to living in a dog house; you can have pets and a clean home — they’re not mutually exclusive! Now your family, Rex and Captain Squeaky Von Fluffington can all live in clean harmony together! 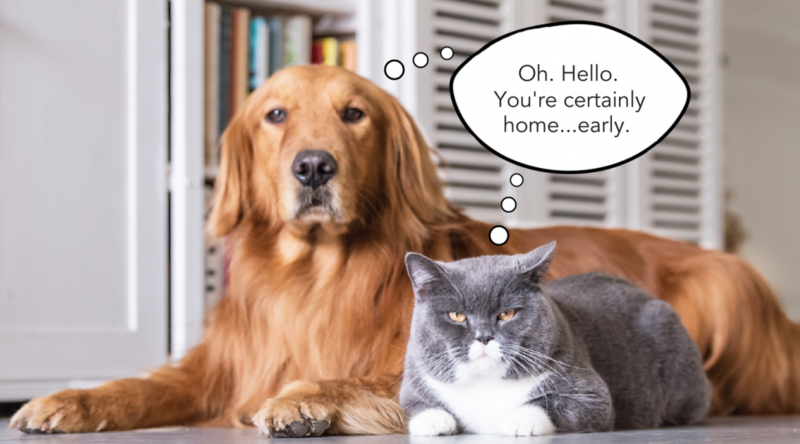 With the right tools, attitude and know-how, your status as a pet owner won’t be the first thing people notice about your home! Literally. And of the cat. Pet hair everywhere is one of the top complaints of pet-loving homeowners. If stopping it at the source doesn’t work (daily brushing helps with shedding — and it’s a smart idea to do the brushing outside) then you need something to remove the hair itself. A dampened rubber glove does wonders to quickly whisk pet hair off upholstered and carpeted surfaces: no fancy lint roller required! But for a home with an abundance of fur (two Persian cats, anyone? ), vacuuming is a must. It can lift layers of pet hair out of rugs, curtains, furniture and surfaces. It can also remove a great deal of two other substances that are often associated with pets: dust mites and dander. Dust mites and dander are both allergenic, so it’s a good idea to remove as much as possible, especially if you have people living in your home (or visiting) who have allergies or are asthmatic. The Lux Guardian Platinum by Aerus. Its high-powered motor (an amazing 505 air watts and 116″ of water lift) easily picks up hair and dust, and the double-sealed HEPA filter means that anything extracted by the Guardian Platinum (dust mites, particulate, dander) isn’t blown back out into the air by your vacuum. It also features a high-porosity, activated charcoal carbon filter to effectively reduce odor and moisture. They don’t mean to. But if you got stuck in traffic or held up in a meeting, you might have a good idea about what’s waiting when you get home: a very ashamed pet and a very dirty floor. Some people prefer using natural cleaning solutions for pet accidents, and others prefer chemical cleaners. Either way: make sure it’s pet-safe and designed to not make odors worse. Blotting a urine accident (rather than rubbing into the carpet further) is also a good idea. If the stain is dry, pour cold water on it and then blot. Tip from the Humane Society: For set-in pet stains, avoid cleaning with anything that has a strong odor, such as ammonia or vinegar. From your pet’s perspective, these don’t effectively eliminate or cover the urine odor and may actually encourage your pet to reinforce the urine scent mark in that area. Pets and kids have a lot in common, in that you never know what they’re going to bring inside the house. Leaves, dirt, mold, dust, mildew (and the occasional dead squirrel) might find its way into your home via the paws of your pets. Placing bristle mats at every door will help catch some of this debris, but over the course of a few months, you might notice your flooring is getting a bit dull from the layers of grime being tracked across your home…and that’s to say nothing of the odors that can get trapped in carpet. Carpeted surfaces generally contain the largest concentration of allergens in the home. Deep cleaning your floors can be necessary when you’re a pet owner, and can go a long way in maintaining and extending the life of your carpet, hardwood or tile. Our pick: The Lux Floor Pro. It can shampoo, wax or polish your floor surfaces — all in one machine. Different additives give you different options: When used with Aerus Turbo Shampoo, the Lux Floor Pro offers a quick dry solution to clean your carpets without leaving a residue. For pet owners, you can use the Home Solutions Allergy Relief with Odor Neutralizer and Dust Mite & Flea Control — a powerful triple threat against pet odors, dust mites and fleas. The Lux Floor Pro uses a unique Circular Dry Foam Method of cleaning, which removes more soil with less water (so less chance for mold or mildew from saturated carpets). We all have that one friend — who, when you walk into their home, the first thing you notice is the whiff of wet dog or litterbox you just got. So don’t be that friend for someone else! A clean home can’t just look clean — it needs to smell clean too, and pets can take a toll on indoor air quality. Again, pets are responsible for large amounts of dander, dirt and hair particles in your home…and that all creates an odor. While it’s tempting to burn a candle or spray a room fragrance and call it a day, it only covers up the offensive or stale odor. It’s best to tackle the odor at its source and actually clean your air. Pet owners should change their air filters more often than non-pet owners, as they’ll probably clog faster. And it pays to invest in an air purifier to rid your home of pollutants and that unique pet smell your house may have acquired. Our pick: The Lux Guardian Air Platinum Purification System. The Guardian Air first charges particles with an ion generator, and then uses a fan motor to direct those particles to the filter, where they’re caught and removed from your air source. Then Photocatalytic Oxidation (PCO) occurs, which is a proven technology that control pollutants. Any remaining particles are captured and retained by the filter, a unique media that performs above traditional HEPA filters. Most importantly, Lux Guardian Air Platinum produces no ozone during filtration, so it’s completely safe for pets and humans alike. Does Aerus plan on coming out with hepa bags for the older canisters that use style C bags? We currently aren’t offering hepa bags for the older models canisters but we offer a carbon prefilter that goes into the canister units to assist with odor and dust control. With the aerus floor pro ( i have an electrolux b8 model) does anyone recommend a specific mop for getting the floor bone dry after i use the scrub function? Also i misspelled my nickname in the first post go ahead and delete the first post.